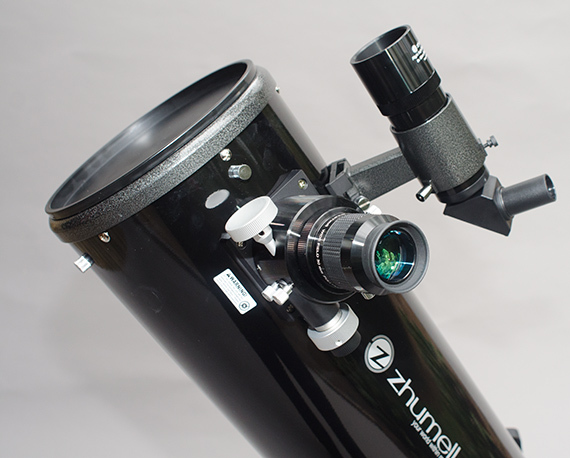 After purchasing my new Zhumell Z8 Dobsonian I thought I would share some information on it. 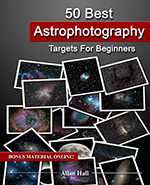 In doing research for my upcoming book “Getting Started: Budget Astrophotography” I was in need of an 8″ Dobsonian telescope. 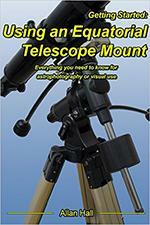 Lots of people have this type of telescope so it is absolutely one that needed to be discussed in the book. Like most people, I wanted the best scope for the best deal I could get and I had heard a lot about Zhumell Dobsonian telescopes, that led me to Hayneedle. If you are curious about the design of the Dobsonian, read more at Wikipedia. Most people who know me know that I typically have a brand preference that I stick with. They also know that I will only stick with that brand if the price, performance and quality are close to the competition. This meant that I wound up comparing the Orion XT8 vs Zhumell Z8. In this case they weren’t really close so I went with the Zhumell Z8 Dobsonian telescope which is the house brand for Hayneedle. To start with the price between the Zhumell and its competition is very close, not really enough to worry about. 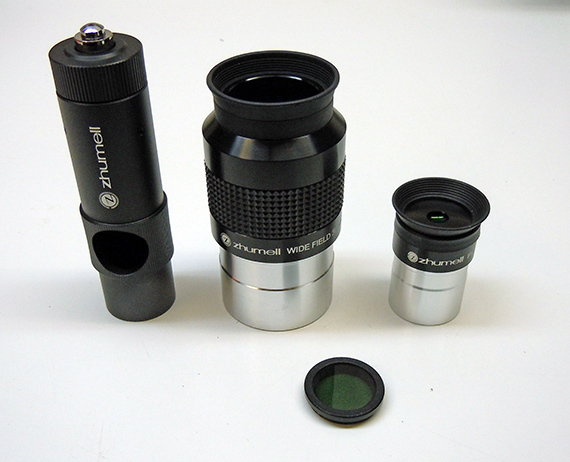 The Zhumell Z8 Dobsonian comes with both a 9mm 1.25″ eyepiece and a 30mm 2″ eyepiece whereas most competitors including the Orion only ship a 25mm 1.25″ eyepiece or something close. In addition they ship a screw on moon filter and laser collimator, the Orion ships with a collimation cap and cheap reflex finder. While I prefer a red dot finder the 8x50mm right angle finderscope on the Zhumell Z8 Dobsonian is a very nice finder and typically considered an upgrade to a simple red dot. Another huge win for the Zhumell is the dual speed crayford focuser that is just as smooth as silk. Finally, my favorite feature is that the Zhumell Z8 Dobsonian has adjustable pivot points so you can balance the scope (Orion has nothing like this), and then adjustable tensioners on each side (not flimsy little springs or friction tape) so you completely control balance and resistance, nice. 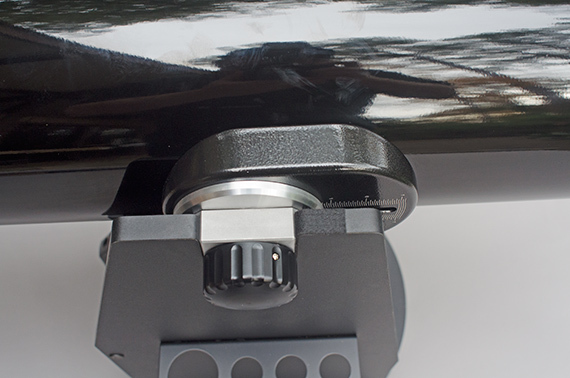 To make this telescope perfect they should offer a kit that swaps the 8x50mm finderscope with a deluxe red dot, and maybe throw in a 2x barlow which would effectively give you the equivalent of 4.5mm (pretty much unusable), 9mm, 15mm and 30mm eyepieces. 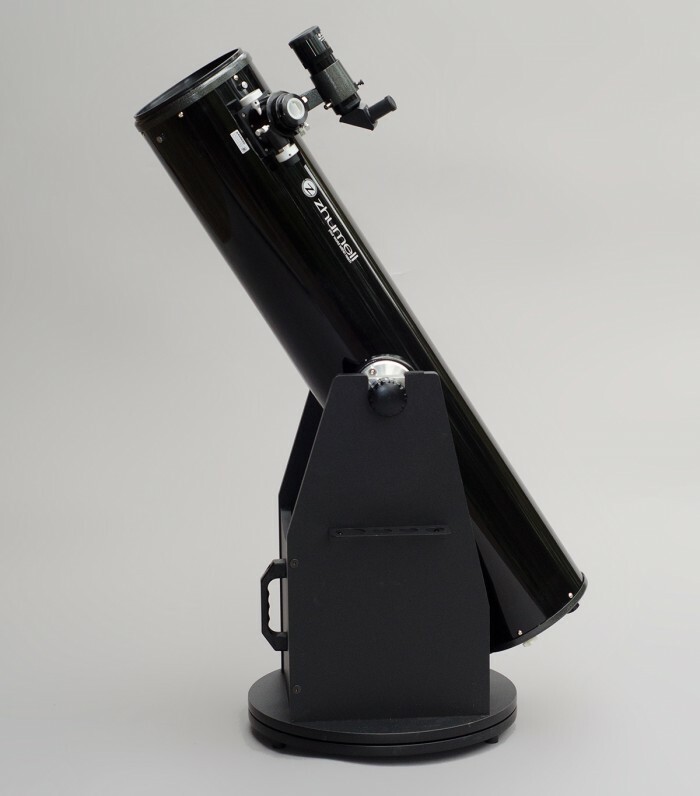 Other than that little pickyness, I highly recommend this telescope and consider it the best Dobsonian telescope in this size and price range. 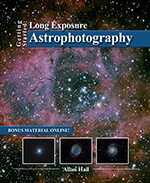 If you are in the market for a Dobsonian, this should be on your short list. You can sometimes pick up the Zhumell Z8 Dobsonian used HERE or head on over to telescopes.com to get a new one. I agree that you do the viewing and the imaging separately. For viewing I picked the dobs 12ixx, a truss type dobs (so very transportable) . Bought an expensive eyepiece with a Uttra wide view and of course the Orion stratus eyepieces for planets viewing and DSO. Further reading got me into atrophotography. My problem is the type suitable mount. I live in ghana at about Latitude 5 N practically along the Greenwich meridian. Most mounts I searched for are suitable for the northern hemisphere and I can understand that. Am sure there is also a reference star for those of us in the south and not Polaris for those in the north. 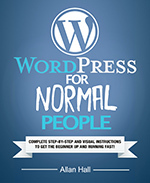 Am sure you ca provide guidance on software to use for pre and post processing. The right angle correct image finder that came standard with this telescope is a far more useful and helpful accessory than a red dot finder. Through this right angle finder, you can find star-hops to deep sky objects that make finding anything in the sky a breeze. A red dot finder merely gets you to a ballpark location in the sky for an object, and then you still have to fish for it with dead reckoning. You can do that much with a green laser and then use the RACI finderscope to star hop to the object you want. That’s completely personal preference. I retrofit all my telescopes (refractor, reflector, dob, whatever) to use higher end red dot finders and have a ton of optical finders like the RACI one from this dob sitting in a box. I find that I can get to my target FAR faster and easier with my red dot as opposed to an optical finder. Again, personal preference.